Celina manufactures a comprehensive range of standard ventilation curtains for swine, dairy, poultry and greenhouse applications. Agri-Barrier curtains provide natural ventilation during summer months and essential winter weather protection, while still allowing for natural light to pass through. Standard curtain systems use no power, making them a green option for livestock ventilation. Material: Standard material types include polyethylene (PE) and vinyl (PVC). The options for material widths range from 60”-196” seamless. All curtain materials are engineered for agriculture use and are UV and abrasion resistant. Width: A curtain’s finished width includes the edge hems and optional pocket hems. Our standard hem is a 4” overlap that will produce a 2.75” hemmed pocket, which will receive up to a 1 ½” outside diameter tube. 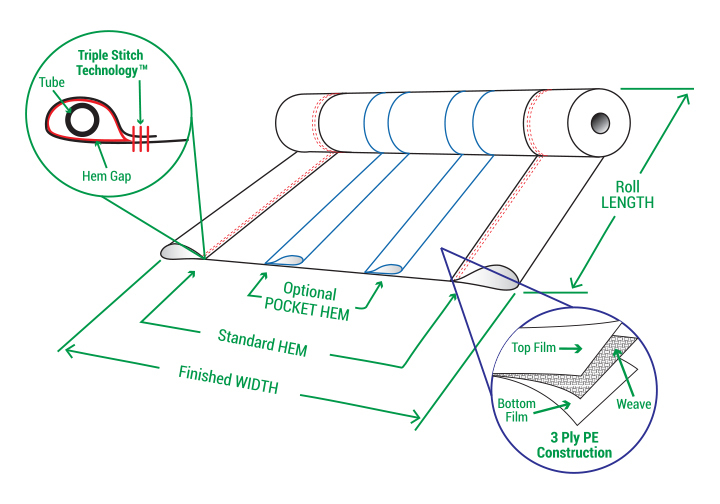 The chart to the right demonstrates the standard hem gap and tube diameter when using Celina’s Triple Stitch Technology™. Length: Standard roll lengths are 600’ for single hem and double hem curtains, with custom lengths available by special order. Celina’s stitching technology utilizes a chain stitch process for both the hems and hem pockets. When cutting the curtain in your facility or during the installation to reach a desired length, care must be taken to “re-seal” the compromised stitch via stapling, gluing or sewing. As per the nature of a chain stitch, once the stitch is cut it will continue to unravel. Any warranties associated with the curtain cannot be honored if the above methods of re-sealing the hems have not taken place. Upgraded heat welded hems and pockets hems are available on all curtains; contact a Celina representative for details. Celina can also help you protect your curtain by supplying an anti-billowing system. Custom systems are made to fit your needs and designed with lashing winches, curtain cord and seat-belt webbing. The anti-billowing system prevents wind and hard weather conditions from damaging your curtain. Warranty: Celina warrants that Agri-Barrier Curtains will be free from defects in material and workmanship for a period as stated per product, prorated on a monthly basis following the date of purchase. Defects are limited to any defect which is a result of the manufacturing process. Excluded are holes, punctures, or other damages which can be caused during normal installation of a curtain. Celina, at its option, will repair or replace this product or any component of the product found to be defective during the warranty period. This warranty is valid for the original purchaser only, and is not transferable. Warranty does not cover normal wear or damage resulting from negligent use or misuse of the product, use contrary to instructions, labor, installation, repair or alteration by anyone other than Celina or forces of nature.